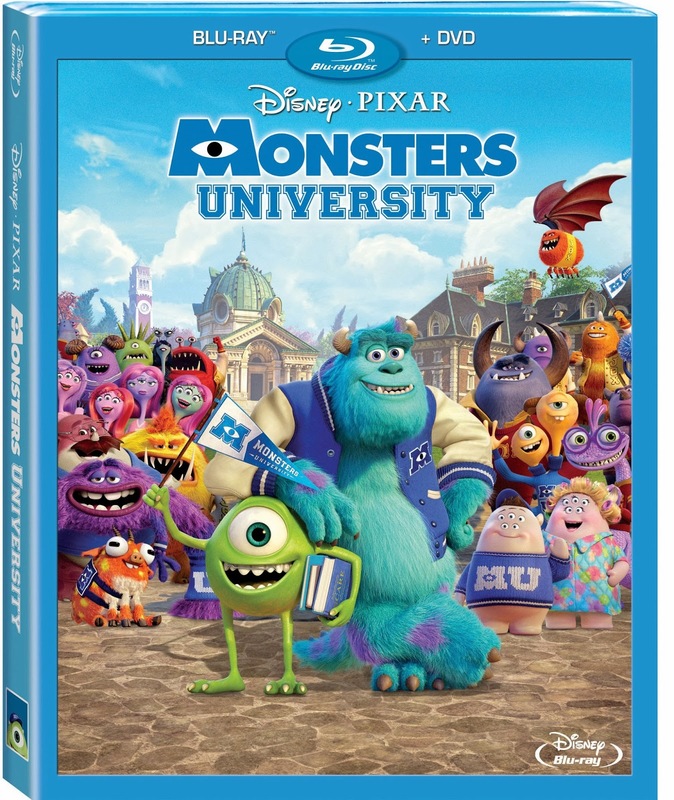 Disney's Summer hit, Monsters University, is available now on Blu-ray & DVD! Bring home the story of how it all began. We absolutely LOVED Monsters University in theaters - so naturally we were super excited to check out this adorable tale at home. 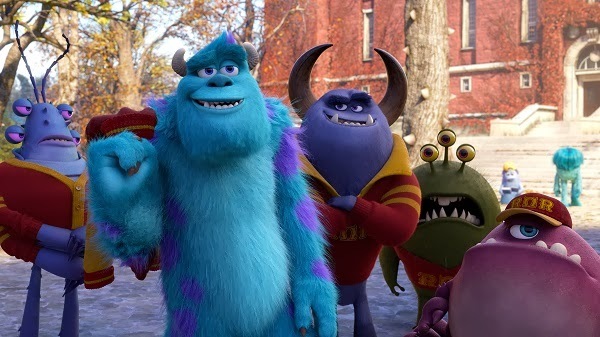 The storyline of Monsters University is in fact a prequel to Disney's wildly popular, Monsters INC.
Monsters University follows Mike, Sulley and a cast of brand new characters as they embark on their college adventure to become "scarers". Mike has dreamt of nothing more than becoming a scarer since his early school days when he took an inspirational school field trip. 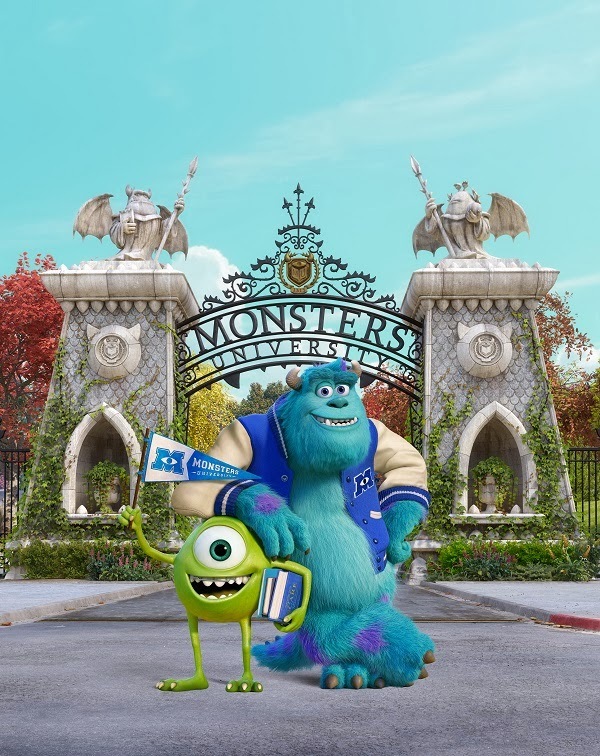 Mike's plans take a few twists and turns though after he arrives on the campus of Monsters University and meets his rival (soon to be friend) Sulley (voiced by John Goodman). 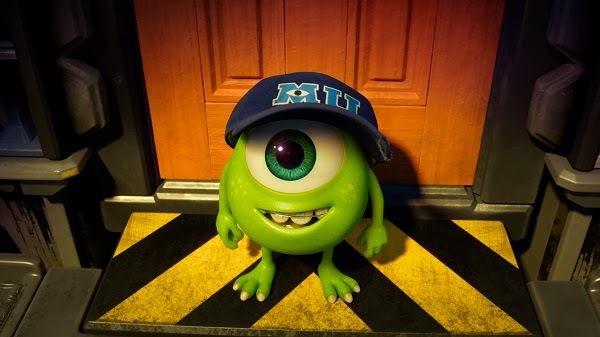 Q: How does it feel to return to the character of Mike Wazowski in Monsters University? A: It feels great. I love being this little guy. He’s my favorite character I’ve ever played in anything I have ever done. I don’t know what it is about him, but he’s so infectious to me. I love him. Q: What excites you most about the return of the monsters of Monsters, Inc.? A:One of the great things about this movie is that the kids who went to see the first movie are now college age. When the first movie came out in 2001, John Goodman [who voices Sulley] and I hosted several screenings for kids in New York. All those kids, and kids throughout the world, were 6 or 7 years old back then. 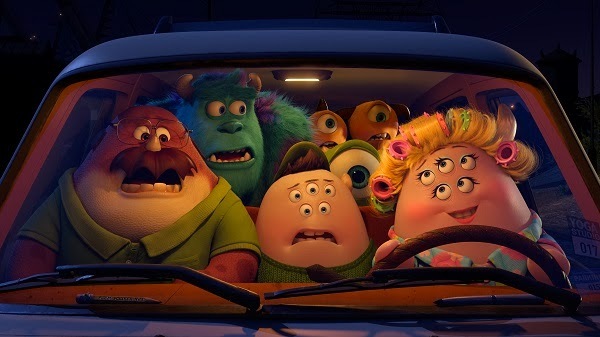 They are now the same age that Mike and Sulley are in the movie, so they can look at it in a totally different light. We recently screened the movie for about 400 film students at USC and they went berserk because the movie is about them. They are making the same decisions in their lives that Mike and Sulley are making in the movie. Q:When it comes to the recording booth for the movie, did you record your voice alongside John Goodman? A:We always do that. In the very beginning, I said, “Can John come and work with me in the recording booth?” They said, “Well, we didn’t ask him. Tom Hanks and Tim Allen didn’t do it on Toy Story.” I said to them, “Well, get him in here and see if he’ll do it.” We soon started to work together in there and then great things started to happen. Q:Why is it better for you to work together in the recording booth? A:There were scenes that could not be done unless we were together, like the quiet moments at the lake in Monsters University. They are very powerful scenes, but we weren’t looking at our scripts. We knew our lines and we were able to act very closely together, just like in the movie. I think it really shows. Q:How would you describe the personality of Mike Wazowski? A:Mike loves to be in charge and he is very driven. I understand him completely. He doesn’t take disappointment easily and he’s always hoping for the best. I dig that. Q:You mention that Mike doesn’t take disappointment easily. When was the last time you felt disappointed? A:I’m constantly disappointed. I was disappointed this morning when they said I was going to be working until 5pm! There are constant disappointments in my life. ‘This movie didn’t work well, that didn’t work well; they don’t want to make this, they don’t want to make that…’ There is always something going on, whether it’s in business or in your personal life. Most of the time, your day never really works out the way you want it to work out. Q:What’s your life motto, Billy? Q:What’s been your greatest achievement? A:Professionally? That I’m still around! This year is turning out to be one of my busiest ever. I’ve had Monsters University and I wrote a book. Plus, I’m going back to Broadway with my one-person show. If there is one thing I loved in particular, it was doing [the play] 700 Sundays on Broadway – as well as all of the tours. That’s why we are going to do it one more time on Broadway. Q:Let’s step back in time, Billy… What were you like in college? A:I was two different guys. At first, I went to school to play baseball – but that didn’t work out, so I transferred home to a junior college where they had a fantastic acting program. That’s where I really went nuts. I was exactly like Mike. I was heavily involved with everything. “Let’s do this, let’s do that!” We built a theater and I got my Actors’ Equity Card – and then I went to film school at NYU. Q:What did you study at NYU? A:To this day, I don’t know why I went to NYU as a directing major. This was nearly 50 years ago and I’ve no idea why I didn’t go as an acting major. I guess I was drawn to directing. I directed various stage projects and I’d made some home movies, so I always liked it. Q:What was life like at NYU? A:As soon as I got there, I went quiet because I was really out of my element. All of the young students were real filmmakers. There was Oliver Stone, Christopher Guest and Michael McKean. Well, Chris was in the acting school but we took film classes together. And my film professor was Martin Scorsese, who was a graduate student not much older than us. Q:What was Martin Scorsese like back then? A:This was 1968 to 1970, and he was an intense guy. He had long hair, a big beard and granny glasses. He was inspirational, but I couldn’t keep up with everything because I was a performer in my heart. Marty was very fluent in movies and he was extremely passionate about them, but I really felt like I wanted to be in front of people. I wanted to be a performer. Q:You famously hosted The Academy Awards for nine years. Would it be a thrill to host them again? Or would it scare you? A: I don’t get scared. My fears are always, ‘Can I be better than I was?’ They haven’t asked me and they probably won’t ask – but if they do, I would listen. However, it’s not something I’m eager to do at this point in my life. As your choices get narrower and your chances to do other things get smaller, I would rather do other things than go back to something I’ve done before. Q:What scared you when you were younger? A:Those nasty people on Twitter. The people with mean comments. Don’t get me wrong, there are some wonderful people on there – but don’t read any of the people with mean comments. Q:Are you active on Twitter? A: Yes, I am. I do it for publicity reasons. And, every once in a while, if I have something funny to say, I’ll say it on Twitter. Q:Have people written bad things about you online? A: At times, yes. But they do it to everybody. Listen, no one likes to wake up knowing that someone doesn’t like them in the morning, but that’s the way it’s got to be. I don’t answer back. You can’t engage them because you don’t know who they are. It’s a weird world that we have uncovered. There are a lot of anonymous people out there on Twitter and anyone who can press ‘send’ is a potential critic. You get the good and the bad; not everyone is going to like it and I get that – but there is a meanness in some people. Q:What are your thoughts on the fact that a lot of movie writers and actors are moving to the small screen? A: I think the best writing is in television right now. I honestly do. What shows do I like? Elementary is great. Johnny Lee Miller is good. He and Lucy Liu are very good together. I also watch [comedian] Louis C.K. whenever he’s on television, but the best show is The Daily Show With Jon Stewart. Q:Apart from watching television, how else do you relax? A: I love being with the kids. And playing golf is a very nice way to get away from everybody and turn everything off. Sometimes, I might not even play a hole; I’ll just walk. Lately, I’ve also been drawing a little. I’ve been fooling around to see what comes out. And I also write. I can’t say it was hard work to write my latest book because it was very comforting to get on a computer every day. I really enjoyed writing it. Q:What can you tell us about the new book? A: It’s a book about aging. I wrote it when I was approaching 65, which was in March 2013. I thought I would go out on the road and perform the things I wrote about – but then they became more like essays, so it became more of a book than a concert. I gave it to my literary agent and he said, “This is good.” So we sold it as a book, and I just kept going and going. It became a memoir about my 20s, 30s, 40s and 50s. It’s very funny, about a man getting older – and it’s called Still Fooling Them. That’s a mantra of mine right before I go out on stage. I really looked forward to working on my computer. Even though it was work, it was very cathartic. I loved it. Monsters University is an absolute MUST-HAVE addition to your Disney movie collection - and would make the perfect pick for your next family movie night! 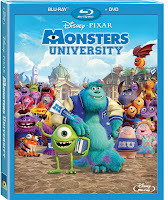 You can Find Monsters University on Blu-ray + DVD now at retailers nationwide. *A review copy was provided free of charge all opinions expressed are our own.